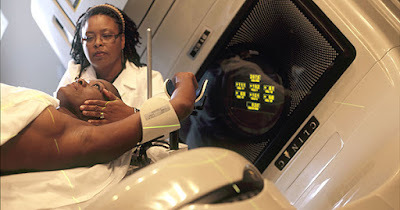 Radiation therapy is one of the most common treatments for cancer. It uses high-energy particles or waves, such as x-rays, gamma rays, electron beams, or protons, to destroy or damage cancer cells. But there are risks! Radiation therapy can cause nerve damage, damage to the heart, lungs and nearby organs. Research done at UCLA Jonsson Comprehensive Cancer Center found that radiation even causes breast cancer cells to form more tumors. So, caution is advised before undergoing any radiation treatment. Why are you recommending radiation, and what results do you expect? How will radiation affect my cancer stem cells? How effective is radiation treatment -- will it kill all of the cancer cells or just some of them? What is your plan to strengthen my immune system during radiation treatment? Will taking supplements help or harm me during radiation treatment? Will radiation increase the rate of relapse in the future? What can I do to improve the outcome of radiation treatment? Will a CAT scan be required (more radiation) to confirm the area that needs to be treated? What would you do if it was you, or your family members? Asking these questions will help you make an informed decision as to what treatment you will accept for your cancer. You have a right to know not only all the facts - but the risks, too!